Sunrise on Hill – Borobudur Morning – Prambanan Temple – One Day Borobudur Sunrise view point on Situmbu Hill. It’s calledBorobudur Nirwana Sunrise. On Punthuk Setumbu Hill you can see mount Merbabu, mount Merapi and Borobudur Temple straight. After that, get the chance to visit Pawon Temple, Mendut Temple,Jogja city and Prambanan Temple in the afternoon. In this tour package, we will offer you another way to experience the scenic sunrise from Situmbu Hill. This location is one of the greatest viewpoints to see Borobudur Temple, The sun will comes out behind of Mt.Merapi and from the hill we could only see the top Stupa of Borobudur temple. Just amazingly beautiful. After sunrise you get to explore Borobudur Temple in the morning. Around this time, the weather will be more comfortable and less crowded to visit Borobudur temple. Then spare more of your time at Borobudur to admire the amazing relief works depicting stories of Sidharta Gautama and his teachings. Extra visit to Pawon and Mendut Temple. Then heading to city of Yogyakarta to visit Sultan’s Palace ( Kraton ) to understand the history of this artistic city, with its grand and elegant model of traditional Javanese architecture and it lies in the center of the city. It was founded by Pangeran Mangkubumi I Then Water Castle ( Taman sari ) just 5 minutes by walking. Taman sari is one of the remaining recreational spots used by royal family in the past. It was built on a small island with an artificial lake around it. Before going to prambanan temple, have your lunch at Sekar Kedhaton restoran incluade visiting Silver Smith and Batik industry at kota gede. After lunch proceed to Prambanan Temple compound. A group of Hindhu temples also known as a complex of rorojongrang, it was erected in the 9th century while Java was ruled by the Hindu Sanjaya of encient Mataram kingdom. It consists of three main temples and shrines in the main area dedicated to respect Hindu’s God Trinity such as Candi Shiva Mahadeva, Candi Brahma & Candi Vishnu. Enough time is given to walk around and observe the beautiful carvings and the neighborhood. Then, transfer back to your hotel in Yogyakarta. Tours finish : 05:30 PM. Sunrise at Situmbu hill a small area on the top of the hill. Visitt The magnificent Borobudur Temple in the morning. Visit Sultan Palace (Keraton) And Water Castle (Taman Sari) will provide both valuable and memorable experience. The Palace that became the center of culture. Visit Prambanan Temple is the last destination of tour where you will visit and see the highest Hindu temple in Indonesia. 03:30 – 04:30 : Pick-up at your hotel in Yogyakarta or another meeting point around the City and transfer directly to the hill. 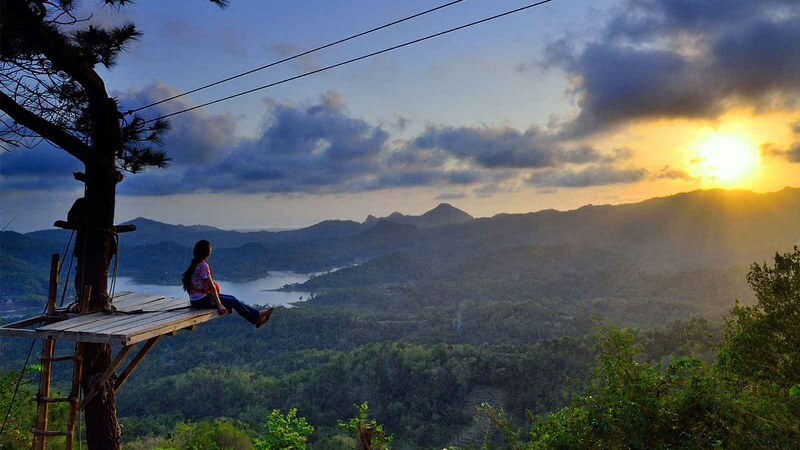 04:30 – 06:00 : Climb up some stairs to reach view point area and enjoy the sunrise. 06:00: – 09:00 : Visit Borobudur Temple in the morning. 09:00 – 10:00 : Visit pawon and mendut temples. 10:00 – 11:30 : Drive to jogja city to visit Keraton and Taman Sari. 11:30 – 12:30 : Visit the Sultan’s Palace. 12:30 – 13:30 : Visit Water Castle. 13:30 – 15:00 : Drive to local restaurant to have Indonesian buffet lunch at Sekar kedhaton Restoran. Then visit Batik Home Industry and Silver Smith at Kotagede . 15:00 – 15:30 : Drive to Prambanan Temple. 15:30 – 17:00 : Visit a complex of hindu temple Prambanan. 17:00 – 17:30 : Arrive in hotel or Airport at yogyakarta ( Free program ). Pawon and Mendut Entrance fee. Sultan Palace, Water Castle Entrance fees, camera fees. Local Guide for Sutan Palace. **) These are another Jogja tour packages and daily tours: Jogja 2 Days Tour, Jogja 3 Days Tour, Jogja 4 Days Tour, Jogja 5 Days Tour, Jogja 6 Days Tour. And find out also our Jogja Daily Tour and Overland Tour to Bromo and bali start from Jogja, Jomblang Cave And Pindul Cave Tubing, Jomblang Cave And Timang Beach Tour, 4D3N Jogja Tour, Borobudur Temple From Semarang, Borobudur Sunrise Prambanan Sunset, Borobudur Morning Prambanan Sunset, Borobudur Sunrise Dieng Tour, FIND OUT YOGYAKARTA TAVEL GUIDE. Sunrise on Hill - Borobudur Morning - Prambanan Temple - One Day Borobudur Sunrise view point on Situmbu Hill. It's called Borobudur Nirwana Sunrise. On Punthuk Setumbu Hill you can see mount Merbabu, mount Merapi and Borobudur Temple straight. May I know how much the rate for this tour is? Also, if I avail of this, would it be possible for me to get picked up at Alana Hotel but dropped off at RedDoorz near the airport at the end of the tour? I’ve sent you an email for the datails..